Among the various wartime book programs the Victory Book Campaign is possibly the most fun to research. It involved all the exuberant American home front activities that you would associate with that patriotic time. There were crowds of smiling volunteers, cool poster designs, promotional radio programs, celebrity endorsements, and lively participation by a public eager to support the war effort. This post offers a general overview of the history, while future posts will focus on specific aspects of the campaign. 1943 VBC poster. Image from The University of Illinois Library. The American military underwent a massive personnel expansion for the war. In 1939 there were only 174,000 men serving in the Army. By the end of 1942 there were 5,400,000, in 1943 there were 7,000,000, and by the end of the war there were 8,300,000. Naval strength increased by 1,400,000 sailors. It was a tremendous challenge to equip and organize this rapidly growing force. Although the government understood the morale-boosting potential of good reading material, supplying more books to military camp libraries simply could not be an immediate priority. Congress allocated money for buying new books, but process was slow, and the book distribution was limited to bases with new construction. There was a serious government-directed publishing program for the troops, but this would not be until the fall of 1943. In the early years of the war it was American citizens who provided the much-wanted books to servicemen and women. As thousands of new recruits flooded into training camps across the country, community librarians recognized an opportunity to lend their support. Individual libraries sponsored book drives to donate to their local military bases. In June of 1941 (six months before the attack on Pearl Harbor) members of the American Library Association met to discuss a plan for a coordinated nationwide drive to supply the troops with free books. The ALA presented their idea to the United Service Organizations and The Red Cross. The reception by both groups was enthusiastic. That year the USO was setting up more than four hundred recreational clubs on the outskirts of military camps. They wanted books for their reading rooms. The Red Cross wanted books to send to military hospitals, remote camps with no libraries, their overseas clubs, and American prisoners of war. The two organizations decided to split the project's funding, while the ALA provided technical know-how. The next step was to approach the government for approval. The military was at first reluctant to accept donated books. They feared that they would be flooded by unsuitable subjects in poor condition. Yet, as John Jamieson explains in Books for the Army, "By the summer of 1941 two facts were very clear: the Army did need books, and whether invited to do so or not, the American people—from school boys to club women—urgently desired to give them. To make a donation of some kind gave civilians a sense of participation in the war effort, and books, to speak frankly, were for most people the easiest things to give." Late in 1941 the Army and Navy gave their approval, and the National Defense Book Campaign was formed. The new organization was headquartered in the Empire State Building in New York City. The first board meeting took place on November 8, 1941. Althea Warren, a librarian from the Los Angeles Public Library, was chosen to be the national director. A week after the attack on Pearl Harbor (December 7, 1941) the organization changed its name to the more peppy-sounding Victory Book Campaign. Warren contacted librarians across the country to set up a campaign director for each state. Specialized committees were formed to handle different aspects of the publicity, book collection, and distribution. External organizations were asked to participate, including book publishers, universities, the Boy Scouts & Girl Scouts, the Works Projects Association (WPA), and others. Books collected by Boy Scout Troop 4, Amarillo, TX. Photo from the Amarillo Public Library. The day planned to begin book collections was January 12, 1942. Books were to be received year round, but the bulk of publicity efforts were made from January to March. To inform the public a variety of PR techniques were used. Posters were designed, radio spots scripted, and press releases sent out. Newspapers and magazines wrote articles, and radio stations interviewed VBC members. Letters were written, and telephone calls were made to state and local government officials. The public was asked to give up-to-date textbooks for military libraries. For the troops' recreational reading the VBC wanted adventure novels, humor books, sports books, mysteries, Westerns, etc. Most people delivered the books to their local library. Boy Scouts and Girl Scouts went door to door asking for donations. In some areas a family could leave a book on their doorstep for the milkman to collect along with his empty milk bottles. Private businesses installed collection boxes for employee donations. Main Street shops designed window displays calling for donations. Children brought books to school. Red Cross trucks could be called to pick up book donations. By March 6,500,000 books had been received nationwide. Warren left her position as director that month, and was replaced by John M. Connor. Librarians volunteered their spare time to sort the donations. Books in poor condition and excess duplicates were sold for scrap paper. Rare books were sold to raise money for the the VBC. Although not requested, many children's books and women's subjects were donated. These were distributed to families in industrial communities manufacturing for the war effort. Books appropriate for the military were sent to warehouses, then distributed to nearby Army, Navy, and Merchant Marine bases. Most of the book were received in the Northern and North Easter states, while most of the new camps had been built in the South and Southwest. Railways offered the VBC reduced transportation rates to evenly distribute the books. 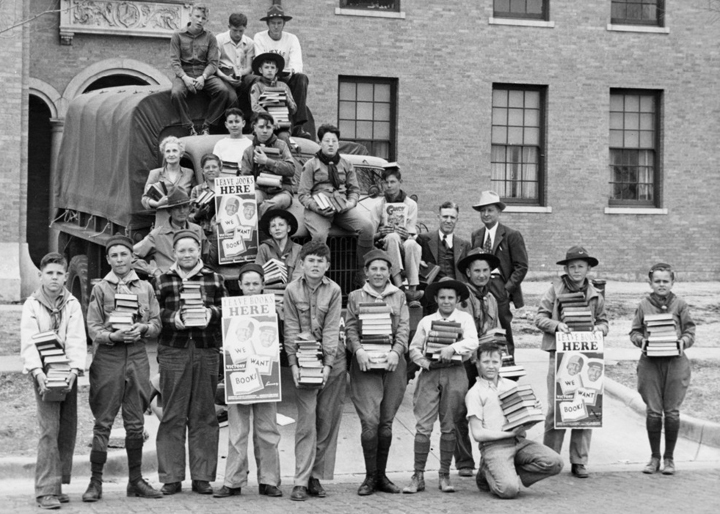 By the end of 1942 the Victory Book Campaign brought in 10,827,097 books. Unfortunately, a very high percentage of these were unsuitable. VBC staffers discarded 5,052,858 books. A valuable and conveniently packaged projectile of morale is a good book. This book may deal with the war; it may deal with the peace; it may range from current affairs to history and biography; it may entertain, inspire, illuminate; it may provide technical information to help a fellow get ahead in the Army or Navy today and in civilian life tomorrow. But most importantly, it is a book that is not dog-eared or tattered; it is not scrap. The first function of a book is that it be read. Only books in first class physical condition can be used. As a weapon in the war of ideas, a book has a place to fill in this war; whether as a source of morale or part of our fighting equipment. Our purpose, therefore, is to provide books—good books, and by that we embrace both physical condition and readability—for the increasing millions of our fighting men—soldiers, sailors, marines coast guardsmen, merchant seamen. We also propose to provide books for U.S.O. centers outside the camps, and for the American Merchant Marine Library Association; and finally, in the event of an over-supply, for the men, women and children in defense areas where increased population has taxed the facilities of local libraries. To sum up, a good test for any book is this: "Any book you really wait to keep is a good one to give." Remember that "good books are ammunition; good ideas are bullets." In May, 1943 the national director John Connor was drafted into the Army. He was replaced by Hellen E. Wessells, a New York Public Library librarian who would later join the Office of War Information (1943–1947). OWI was the government agency in charge of wartime propaganda. 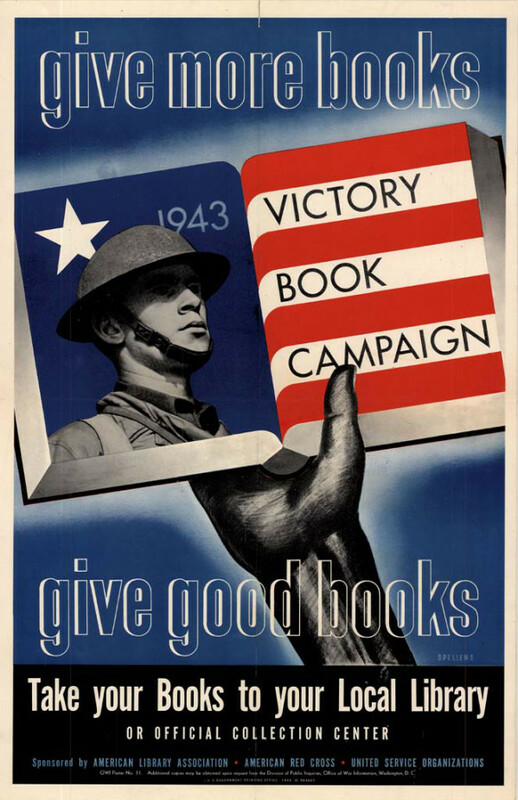 The office saw books as important to the morale of American soldiers and civilians, so it gave the Victory Book Campaign status as an official government project. OWI designed and produced 100,000 posters, and it assisted in promoting the campaign on the radio and in movie theaters. Many more national organizations were added to the 1943 list of those assisting in publicity and collection efforts. Churches, 4-H clubs, Lions clubs, Rotary clubs, and others wanted to do their part for the campaign. The 1943 book drives brought in 7,622,877 books. Again, a large proportion of books needed to be discarded: 3,106,403. "I wish you could be present here to see the eager response shown by the men on reception of this gift of fine books. I believe that you have helped considerably in allaying the natural discontent of the soldiers in this barren army post which is sadly lacking in recreation facilities. I feel that the Victory Book Campaign has done an exceptionally good Job in the selection and distribution this year." There were several drawbacks that prevented the VBC drives from continuing in 1944. Chief among them was the inefficiency of the process. Due to their condition and subject matter only 56% of donated books were suitable for distribution. By the end of 1943 the intended readers for these books were being sent to posts overseas. The vast majority of donated books were hardcovers. Their weight and size made shipping prohibitive. VBC books delivered outside the country competed against more crucial military supplies for the cargo space. In 1943 the military had made an agreement with American publishers to produce a series of books exclusively for the troops: the Armed Service Editions. These lightweight paperback editions of the newest and most popular titles made the Victory Book Campaign obsolete. Final Reports, Victory Book Campaign 1942–1943. American Library Association, American Red Cross, United Service Organizations. New York, 1944. Hench, John B. Books as Weapons: Propaganda, Publishing, and the BAttle for Global Markets in the Era of World War II. Cornell University Press. Ithica, 2010. Fabulous article! I printed it for future reference and posted it to Facebook. I'm very much looking forward to this new book. Great piece Andrew. I like that every part of the book was used. If there were too many duplicated etc it would be used as scrap or given to families engaged in the war efforts. You could never do this program with ebooks. I wonder if the Army has any similar programs in place nowadays. I wonder if there are cheap e-readers being given to soldiers etc. If so, I wonder the implication of the waste that produces when the devices break etc.